I guess complaining about cell phone companies is nothing new, but here goes anyway. Our two-year contract has long expired and Verizon keeps dangling free phones in front of our noses to entice us into sign a new one. 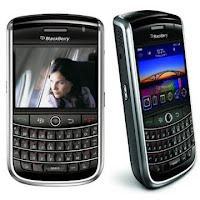 Our old phones are actually getting pretty worn out, so we finally went to a Verizon store to look at our options. As it turns out, nearly every phone in the store isn't compatible with our "legacy" plan, and to get one we would have to pay an extra $10 a month to upgrade from 500 to 700 minutes (even though we have never even topped 200). 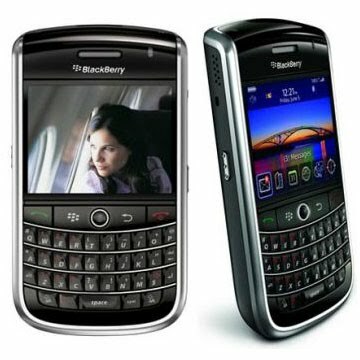 I guess the old adage really is true,"There's no such thing as a free 3G smartphone with touch screen technology and WiFi." Every so often, while driving around town, I will notice a large banner on a street corner calling shame on the adjacent business. I never really know if these poor folks braving the elements have a just cause or not because, frankly, I'm too busy wondering why all their banners look the same. Seriously, the layouts are always identical—"SHAME ON (COMPANY NAME)" in big red letters, then the smaller words "LABOR DISPUTE" angled on each side. 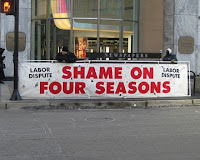 Is there some all-encompassing Labor Dispute Banner Emporium that produces these? And more importantly, what happens if they have a labor dispute? Speaking of street corner signage, I'm dying to know the origin of the recent explosion in shakerboard advertising. 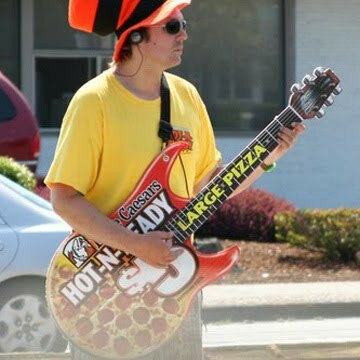 I mean, is there any actual market research to prove that paying a lurpy teen minimum wage to strut, dance and play air guitar on the sidewalk with a Hot-N-Ready Pizza sign is more effective than, say, staking the sign in the ground? Really, they should just go down to the Labor Dispute Banner Emporium and get a large banner that says "SHAME ON YOU FOR NOT BUYING A HOT-N-READY PIZZA." Wow. Nothing makes me crave pizza like a spinning sign and two shirtless guys dancing badly. Actually that might be as nauseating as 3D movies. 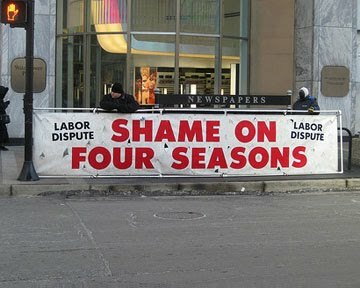 You know, I saw one of those Labor Dispute signs in Sandy the other day, calling shame on Target. They picked theirs up from the Labor Dispute Banner Emporium too. 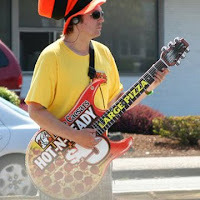 And in West Valley last week, I noticed a lurpy teen in a Little Caesar's mascot costume trying to out-shakerboard another lurpy teen from the competing Generic $5 Pizza Store Across the Street. You can guess who won that shakerboard-out. I bet those shirtless guys are famished from working as extras in the Twilight Saga. And nothing makes you crave mediocre pizza like mediocre vampire romance. Such a funny, great post. What was with the shirtless guys dancing in the background? What morons! There were 3 shakers for our Little C's on 3 separate corners the other day. I know that can not be worthe the $6.50 an hour they are paying those guys.